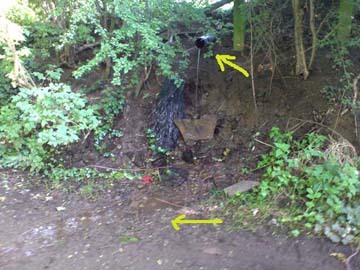 The following pictures are of the Mill Lane section of the proposed Connect2 route between Stockport and Marple. Some time ago members of Cycle Stockport and other cyclists met Officials of Stockport MBC at a regular Cycle User Group meeting. 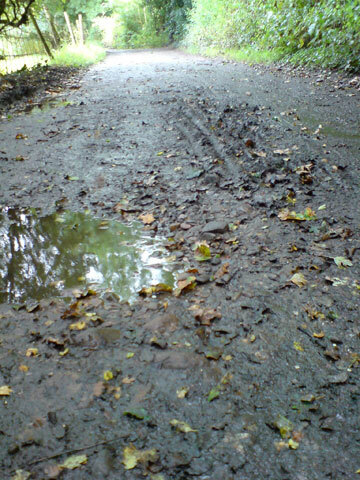 We were told there was money available to upgrade the route and we suggested that a strip of Tarmac from Otterspool Bridge to Bredbury Hall was prefered, but if too expensive then work should be done on improving the drainage on the track in order to reduce the muddy sections and the deterioration of the track due to erosion. 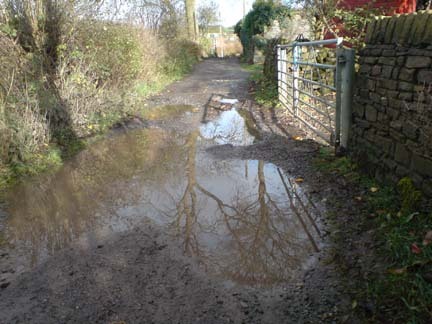 The Stockport MBC representative said this was not what they prefered and they would fully tarmac the route from Otterspool Bridge to the first farm. We said this would only benefit a tiny minority, primarily motorists. Stockport went ahead with their proposal and tarmacced the road. 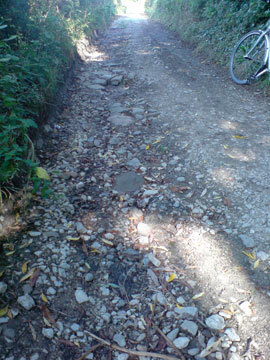 Within days the initial section of road was dug up and replaced with cobbles after, we have been told, a horse rider was dismounted and claimed the surface was unsuitable for horses. the whole length of the re-surfaced road has been given a strip of anti-skid surfacing. and is potentially dangerous to those who may fall, for example children out for a country walk. If you think this not the way to spend the Council's money when creating what should be a multi-user trail and a cycle commuting route between Stockport and Marple, then please make your views known to Stockport's Sustainable Transport Dept. and your local Councillors. 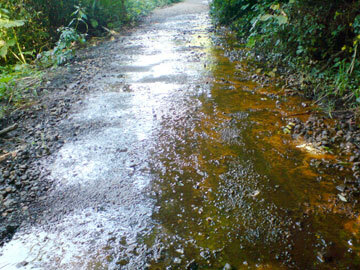 This is the short track that leads from the Iron Bridge in Brabyns Park to Compstall Road. 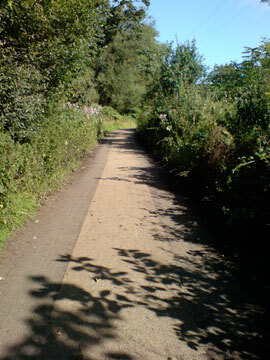 It is used by many pedestrians and cyclists as part of the route between Marple and Compstall. 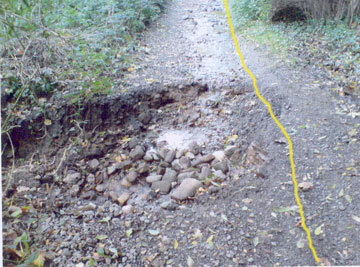 Requests for it to have its surface repaired have resulted in Stockport's Rights of Way Officer saying it is perfectly adequate. Help us to persuade Stockport MBC to cater for all their residents by contacting your local Councillor.